I finally achieved the pizza dough I always wanted. I recently made a “white” pizza with this dough. 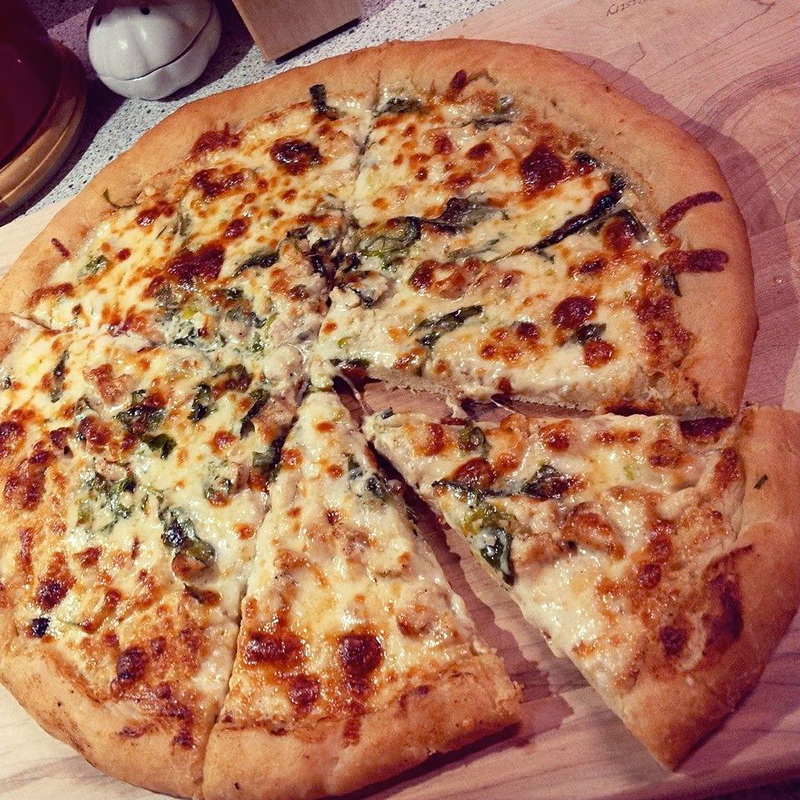 A white pizza is made with creamy Alfredo sauce and toppings such as grilled chicken, (lightly seasoned with salt and fresh ground black pepper), fresh spinach, and fresh green onions finished with shredded mozzarella and provolone cheese. You’ll experience a fluffy and crispy texture with every bite. Its great for flat breads, calzones and any pizza you’d love to create! Go on now, have a fun time with this recipe! In a small bowl, mix the yeast in the warm water. Allow to sit for 10 minutes. In a standing mixer with a dough hook, combine flour and salt together on low speed. Slowly add the olive oil. Gradually add the yeast mixture until its well combined with the rest of the ingredients. *The dough will appear at this point very sticky. That’s ok, this is how we want it to be. With a floured spatula, scrape the dough out on to a lightly floured surface and form a ball. *A little extra flour is needed to form the dough. Knead gently. Place it in a lightly oiled bowl and drizzle a little oil on top of the dough. Cover with a damp cloth and let the dough sit in the warmest part of your kitchen for 1 hour. *If you are making the dough in advance for another day, cover the bowl with plastic wrap and store it in your refrigerator.